Back to School time is here, and there are a few trends that are causing a kid-sized frenzy. But those frenzy-inducing items aren’t just for the classroom or the locker. There are several hot back to school trends you’ll want for your home office! My kids headed back to school almost a month ago. How about yours? With a teenage daughter who’s headed to high school for the first time, we kept an eye on this year’s back to school trends…. But it is my favorite time of year to snag the must have cute and cool back to school supplies to use in my home office. Don’t miss the essential back to school supplies and back to school trends you’ll want in your home office! I’ve already added some of these trend-setting items to my home office and several others are on my wish list! This post contains affiliate links for your convenience. Click here to read my full disclosure policy. As always, my favorable opinion of trend setting school and office supplies are 100% my own. I only recommend products that I use and love! Pencils are no longer just pencils. They’re a way to express your personality, keep track of the days of the week, and manage the environment around you. And that makes writing with them so much more fun! Show off your feminine side with these pink Smarty Pants Pencils from the Etsy Shop, Smarty Pants Paper Co. Need a place to store all of your new, full-of-personality pencils? Try this quick and easy DIY Desk Organizer! I love the versatility of journals and diaries. I use them for organizing just about everything including my thoughts, ongoing and upcoming projects, to-do’s, goals, keepsakes, and so much more. So, of course, I was thrilled to see a plethora of fun and unique journals and diaries popping up in this year’s trends! Any journal from Peter Pauper Press! This is the Peter Pauper Press journal I’m currently using. I also have this Gold Dot Journal. And this Owl Forest Journal (one of my all-time faves)! Monograms are back! And they’re popping up on everything. Monogrammed Folders from Designs by Brandi Co.
Or snag a set of these monogrammed stickers and monogram all the things! These stickers are from When It Rains Paper. Washi Tape is a little like journals for me…I use it for organizing everything! Not only is Washi Tape hot again this year, so are Washi Tape dispensers. I can’t wait to use this set of Washi Tape from Allydrew. This Washi Tape Dispenser is chic in its transparent-ness (yep, I just made that word up), and it comes with washi tape! These Kate Spade Bow Push Pins are adorbs. And I can’t wait to store my best pencils in this Kate Spade Pencil Pouch! For yet another school year, emoji adorned items are flying off the shelves. I’ve all ready got a set of these Emoji Binder Clips in my office (and I sent a set to my oldest daughter for use in her office). Pencil cups aren’t just plastic and metal anymore! There are hundreds of ways to express your personality with your pencil cup. These Pastel Pencil Holders are made with concrete. I think I’ll keep these for myself…I don’t see the school loving these as much as I do. They’re from the Etsy shop, Beton Deko. This elephant pen holder does double duty and provides a propping place for your phone, too! If you’re like me, this isn’t so much a trend as a necessity. My calendar/planner is how I keep my life from dissolving into chaos! We use The Flylady Calendar every school year. It serves as our family calendar and the central feature of our command center. I love it because the squares are large, and it starts in August, just in time for the busy school schedule. Plus, it has a seriously handy pocket in the back. No more lost school papers! Learn more about how we add hours to our day by using our calendar here! And snag your copy of my FREE printable single month calendar here! The other planner I always use isn’t a traditional planner. It’s a goal planner by Lara Casey called Powersheets. And it has helped me to make this year my best yet! The 2019 Powersheets will be available on October 24th. Mark your calendars! So, these are a few of the back to school trends that are causing a kid-sized frenzy. And you’ll want to steal them for your home office! Whether it’s journals, pencil cups or pouches, emoji-themed supplies, or washi tape, you’ll find something you love for your office among kids’ school supplies. Which one will you add to your office first? Or maybe you’ve got your eye on a different trend? Is getting your home office organized on your “once the kids head back to school” to-do list? 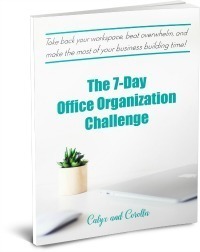 Check out these 8 Steps for Getting Your Home Office Organized! Looking to make better use of that time spent waiting for your kiddos to finish up school or their activities? Get more done and be more organized by setting up a Mobile Home Office! Are you hoping to create a better morning routine now that back to school is right around the corner? 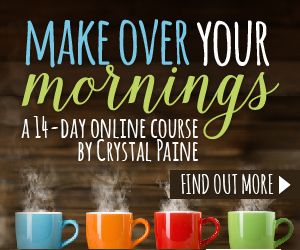 Check out the 5 Essential Morning Routine Elements!